Formerly known as los Hermanos Corona, Mexican Grupo Exterminador made their debut in 1992, getting a record deal soon after. The band's debut album, Me Gusta Ponerle Al Polvo, was released by Fonovisa in 1995, including the hit single "El Meneito." 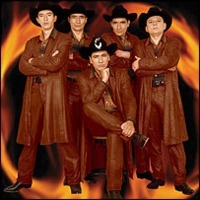 Grupo Exterminador started climbing Billboard's Hot Latin Tracks with "El Tiburón." This song is featured in their following album, called Dedicado a Mis Novias.